Home security has never been more important, and homeowners want to protect their house from trespassers as effectively as possible. Learn more about a few ideas to create effective security lighting for your home and yard. Home security has never been more important, and homeowners want to protect their house from trespassers as effectively as possible. Outdoor security lighting is a great way to illuminate your home and deter burglars from entering your home at night. 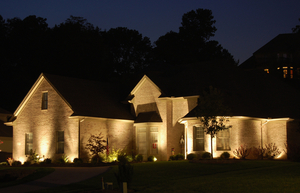 Continue reading for a few ideas to create effective security lighting for your home and yard. While motion sensors were once thought to be the best type of security lighting for homes, professionals in the security industry have found that these lights are ineffective against trespassers. This is because the motion sensor lights may not turn on until after the criminal has entered the property. Also, when a trespasser sees a dimly lit home, they often make it their target and won’t stop because of one motion sensor light. A well-illuminated property is the best defense against criminals, as they will not usually try to enter a property with lights on. While outdoor lighting on your home is essential, it is not enough to keep your house secure. Landscape lighting adds another layer of protection, as it illuminates your driveway, patio space, and dark corner of your yard. Installing floodlights on your garage or in trees is also a great way to provide a heightened sense of visual control over your property. Some areas around your home need more security than others, especially the garage and back or side door. These areas are high risk, as most criminals think they will be the darkest areas, therefore the easiest to sneak into. However, by installing outdoor lighting around your garage and back door, you can feel safe knowing your home is protected. You never know when a trespasser can attempt a break-in, so it’s crucial to keep your security lighting on from dusk until dawn. If your outdoor lights on only on for a few hours during the night, they may not provide any assistance in keeping your home secure. Even if you live in a safe area and don’t believe a trespasser will ever enter your home, it’s always better to be safe than sorry. Also, while outdoor lighting is great for protecting your property, it also provides a beautiful enhancement to your home! This entry was posted on Thursday, September 27th, 2018 at 11:59 am. Both comments and pings are currently closed.